MANY scenarios meet the teams from River Canal Rescue when they attend a problem, which means the training to tackle them has to be kept up to date. 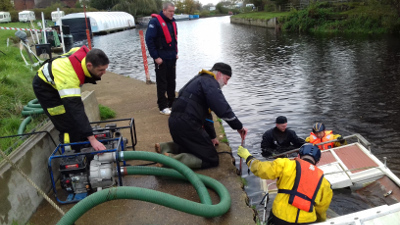 So 34 staff from the breakdown and assistance firm were recently put through their paces during a week of rescue training at Red Hill Marina on the Soar. Front-line engineering and office-based staff first went through the theory of a rescue, learning how to assess risks, formulate plans for safe rescue attempts and how to use rescue equipment safely and efficiently. Office staff are included in the training as they regularly support rescue teams that are called to attend incidents and are now active members of the rescue teams. Rescue training is held once or twice a year, dependent upon the number of call-outs.